Come one come all to the second annual Vision Quest garage sale! 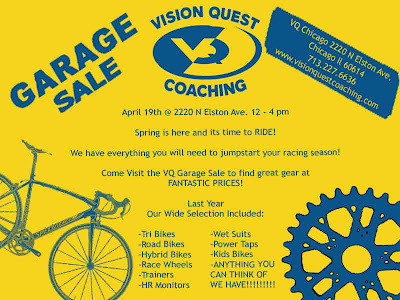 If you're in the Chicagoland area on April 19th --and even if you're not, the savings are worth the drive-- be sure to stop in to the Vision Quest headquarters between 12-4PM CST for major savings on PowerTaps, Zipp wheels, kids' bikes, tri, road, cross and track bikes, cycling shoes and even wetsuits. Recreational to high-end products will abound, and even SRAM will have items available. Get there early for the best deals of the season!